Ramallah- 10/9/2015- The Israeli occupation’s military commander renewed the administrative detention order of the hunger striking detainee Nidal Abu Aker (46 years old) for further three months thus extending his detention without charge or trial until 10/12/2015 according to Addameer’s lawyer. Meanwhile, Nidal Abu Aker continues an open hunger strike in protest of the administrative detention policy calling for its end along with fellow administrative detainees Ghassan Zawahreh (34 years old), Shadi Maali (39 years old), Munir Abu Sharar (31 years old) and Bader Al-Ruzzeh (27 years old). 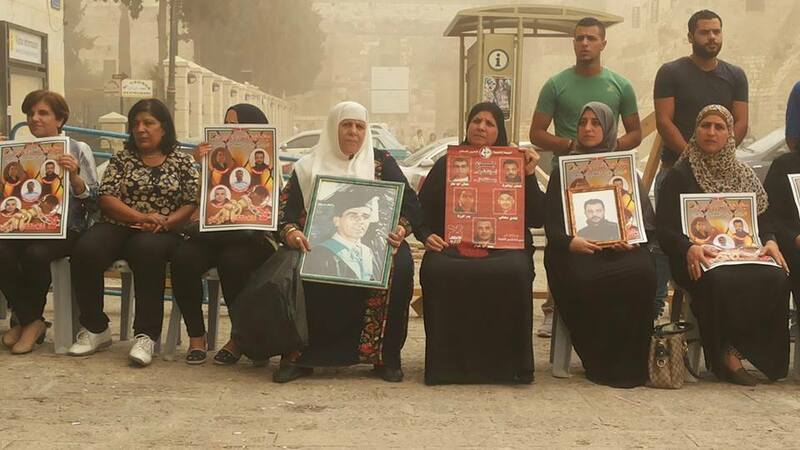 The Israeli Prison Service (IPS) placed the five hunger striking detainees in isolation in Al-Naqab, Ashkelon, Ela and Eshel prisons shortly after they started the hunger strike. Shadi Maali was transferred yesterday from the isolation at Ela prison to Al-Naqab prison by the IPS. Addameer’s lawyer, adv. Samer Samaan visited two of the isolated hunger strikers (Munir Abu Sharar and Bader Al-Ruzzeh) at Al-Naqab prison on 8/9/2015. Abu Sharar informed Adv. Samaan that he and Al-Ruzzeh are rejecting medical examinations as well as salt and supplements. He added that he is being held in a 2.5x2.5m cell that has a 50 cm window completely covered with metal. The cell has a toilet but doesn’t have a shower. Instead, the shower is located outside the cell and Abu Sharar gets shackled whenever he needs to use it. Abu Sharar said that the administration doesn’t provide them with cold water and forces them to drink from the faucet that is inside the cell where the water is very warm, they also don’t know if the water is drinkable or not. Abu Sharar added that Bader Al-Ruzzeh refuses to meet a lawyer because the administration at Al-Naqab prison forced him to wear the “Shabas” uniform if he wanted to see a lawyer, which is an unacceptable measure for administrative detainees and is used by the prison’s administration to put pressure on the detainees. Adv. Samaan also visited Nidal Abu Aker at the isolation of Ashkelon prison. Abu Aker told Adv. Samaan that he is being held in a 150x180cm cell that contains a bed, a toilet and a shower. His hands and legs gets shackled whenever he needs to leave the cell. All of his personal belongings were confiscated when he was transferred to isolation. As for his health condition, he told Adv. Samaan that he lost 12 kilograms since the beginning of the hunger strike, he suffers from throat inflammations and is not taking his blood pressure, cholesterol and stomach medication. It is worth noting that by the end of August 2015 the number of administrative detainees reached 350. 30 of these administrative detainees started boycotting the occupation’s military courts since July 2015 to in protest of the impartiality of these courts and the fact that they are a mere formality. These court’s reliance on secret evidence not accessible to the detainees nor his lawyers renders them a tool to simply legitimize the occupation’s practice of arbitrary detention.